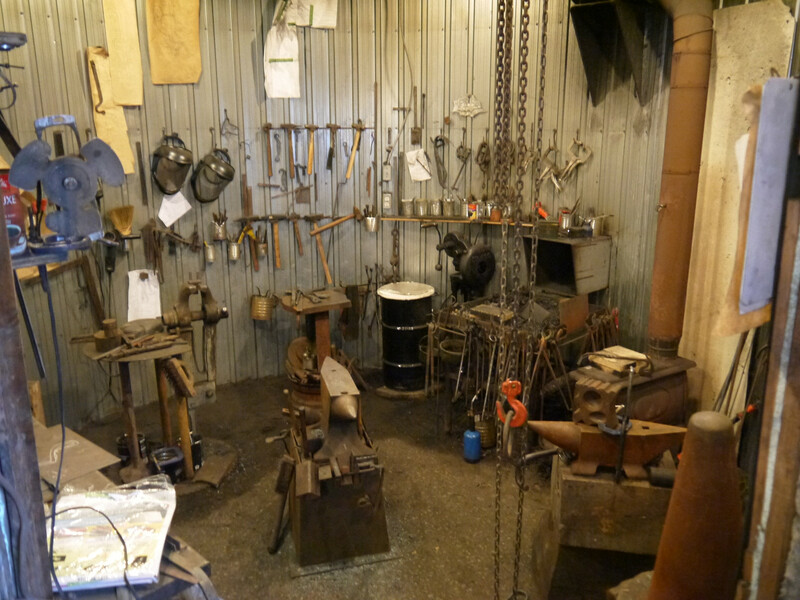 Tell us about your blacksmith shop. - The Iron Forge Fire Blackmithing Forum. I would like some ideas on smithy. I'll be building on the side of a hill. The basic idea I have to start with is a pavilion I saw at a park. I thought That would work great for my shop. I'll use limestone for the back wall and build in a forge. The images show the shelter that's actually built into the side of a pretty steep hill. Throw on a wall and a sliding door and I'll have a decent shop. I've already terraced the construction site and have started free stacking stone for retaining walls. Does anyone else have a Blacksmith shop in the side of a hill? I haven't been on the site for a while. How is your building a Smithy in the side of a hill going? If its been worked on (or finished), is any chances of a few photos? I have started to build an embankment 4.5 to 5 metres (16 to 18 feet) high to block out road noise, give privacy as well as terraced gardens and that idea of yours of a shop being built into a bank or hill really appeals to me as well. I don't have a shop right now. In fact I haven't hit a piece of steel in a while but the images you posted look like it would make a great shop ! The new barn is almost electrified, the storage mezzanine has the idea laid out on the floor of the Barn, cutting wood to get that completed and clear up the floor of the Barn and then I can fire up the Gas Forge and try to make a cross. (I promised my daughter she would get the first one AND she keeps asking ). Pictures will come when I get the storage area completed and the floor cleared, sorry. I "live" in a silo. It is very functional. Nice set up indeed! Trouble is, if in a silo, the noise and the echos Id imagine would be a major problem. I imagine you'd have to wear ear plugs and muffs at the same time. How long did it take you to collect all the gear? Reminds me of Jack Andrews Edge of the Anvil where he sets up in a tepee. May not be able to do long stuff but everything would be close at hand. My main anvil is on a 1/4" steel stand full of sand. There is no agressive noise coming from there. The Nimba anvil has magnets. It still rings but I use it very little. The son is the main user when he has the time. I do wear ear muffs when I use the chop saw (even outside, I hate the beast!). As for the collection of the gear, I bought most of it when I decided to forge. Of course I added stuff. Recently a welder mainly to weld templates and things around our property. A Silo for a house and Smithy... sounds interesting ! Working with rounded walls would drive me crazy, just getting a bench to sit against a flat wall makes me happy ! Nice Smithy, hoping to have my Shop up and running soon.